CARFAX Certified 1 Owner - No Accidents - Fully Serviced - Quality Certified W/up to 10 Years, 100,000 miles Warranty This Honda includes: BLACK, CLOTH SEAT TRIM WHITE ORCHID PEARL *Note - For third party subscriptions or services, please contact the dealer for more information. * Why does this vehicle look so great? The CARFAX report shows it's only been owned by one owner. You know exactly what you are getting when you purchase a Certified Pre-Owned like this Honda Civic Si Coupe. The less money you spend at the pump, the more money you'll have to spend on you. So why not consider this wonderfully styled, fuel-efficient Honda Civic Si Coupe. With complete records on this pre-owned vehicle, you'll have peace of mind and the satisfaction in knowing your new purchase is safe and reliable. The interior of this Honda Civic Si Coupe has been through meticulous inspection and could almost pass for a brand new vehicle. This Honda Civic Si Coupe is well-equipped, well-cared for and still covered under the manufacture's factory warranty. Some vehicles are more of a need-to-have. This one is a absolutely-must-have. If it's looks aren't enough to persuade you, the feel of the powerhouse under the hood most definitely will. The Honda Civic Si Coupe is in a class on its own. So much so, that Honda didn't miss a beat when they loaded this vehicle with an abundance of a-la-carte options. With no signs of paint damage, the exterior of this Honda Civic Si Coupe is sure to impress. Just because it's pre-owned doesn't mean it can't look new. If you're looking for a one-of-a-kind automobile, look no further. We are proud to offer this 2018 Honda that truly a must-have. This vehicle's wheels are one of the many attractive features that this Civic Si Coupe has to offer. No Credit / Bad Credit / No Paystubs, No problem !! ! All Approved ! Everyone drives ! CLEAN, GORGEOUS, LOW MILES, SHOWROOM CONDITION. CALL NOW QUALITY CERTIFIED up to 10 YEARS 100,000 MILE WARRANTY , To Certify a vehicle, there will be an additional cost for Certification. CALL NOW For details. STUNNING AGGRESSIVE LOOK ON THIS BEAUTIFUL--Call today to schedule a test drive... Good Credit/Bad Credit/No problem!!!! Get paid cash? No problem!! 100% Credit Approval with interest rates starting at 2.49% for qualified customers, our rates will not be beaten. We price our cars at wholesale price to guarantee the best deals for our customers. Our inventory moves quick, please call to confirm the availability of the vehicle of your interest Springfield location 973-564-0112. This vehicle is located at our SPRINGFIELD location. Come visit our new showroom in Springfield NJ. This 2018 Honda Civic Si Coupe is offered to you for sale by Quality Auto Center. This a worry-free vehicle that has passed our certification process. Why spend more money than you have to? This Honda Civic Si Coupe will help you keep the extra money you'd normally spend on gas. Driven by many, but adored by more, the Honda Civic Si Coupe is a perfect addition to any home. 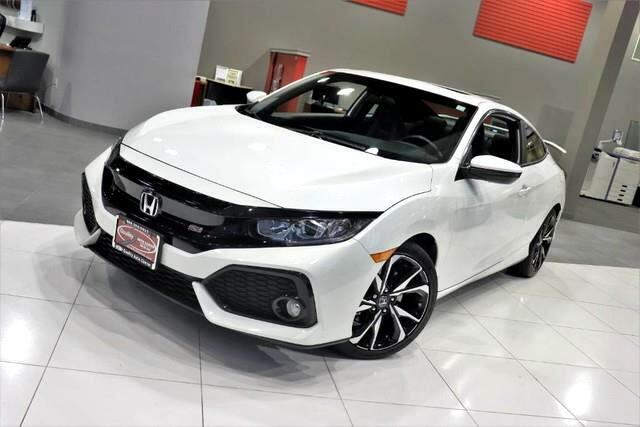 Surprising quality accompanied by a high level of performance...this White on Black Honda Civic Si Coupe could end up being the perfect match for you. No Credit / Bad Credit / No Paystubs, No problem !! ! All Approved ! Everyone drives ! CLEAN, GORGEOUS, LOW MILES, SHOWROOM CONDITION. CALL NOW QUALITY CERTIFIED up to 10 YEARS 100,000 MILE WARRANTY , To Certify a vehicle, there will be an additional cost for Certification. CALL NOW For details. STUNNING AGGRESSIVE LOOK ON THIS BEAUTIFUL--Call today to schedule a test drive... Good Credit/Bad Credit/No problem!!!! Get paid cash? No problem!! 100% Credit Approval with interest rates starting at 2.49% for qualified customers, our rates will not be beaten. We price our cars at wholesale price to guarantee the best deals for our customers. Our inventory moves quick, please call to confirm the availability of the vehicle of your interest Springfield location 973-564-0112. This vehicle is located at our SPRINGFIELD location. Come visit our new showroom in Springfield NJ.